Untitled, 2006-2009. Page from Pump & Dump LLC’s Investment Proposal that is sent to potential clients interested in investing in our portfolio of adult entertainment companies. 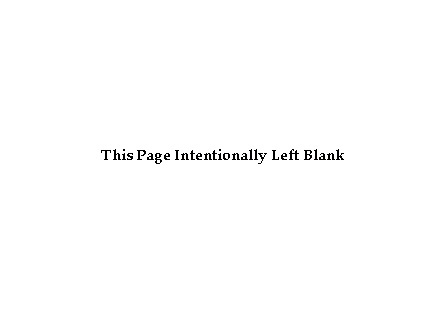 The phrase “This page intentionally left blank” is a self-refuting meta-reference, in that it negates itself by its very existence on the page in question. Appropriating corporate strategies to create work in a variety of media, Laura Carton's practice explores the relationship between art, economics and politics. Her work has been exhibited at the Haus der Kulturen der Welt, Berlin, the Queens Museum of Art, NY, the Bronx Museum of the Arts, NY, the Institute of Contemporary Art, Philadelphia, Real Art Ways, Hartford, and Von Lintel Gallery, ApexArt, Jamaica Center for Arts and Learning, Artists Space, Art in General, and White Box in New York. She was awarded a Jerome Foundation Travel & Study Grant (2007), a Creative Capital Foundation Grant (2006), a NYFA Fellowship in Computer Arts (2001) and was nominated for The Baum: An Emerging American Photographer Award and the Rema Hort Mann Foundation Grant (2002). A monograph of Carton’s photographs entitled Stripped, will be published by Nazraeli Press in Fall 2009. Born in Los Angeles, Laura Carton received a B.A. in French Literature from the University of California, Berkeley and attended the Whitney Independent Study Program (2001-2002). She lives and works in New York.